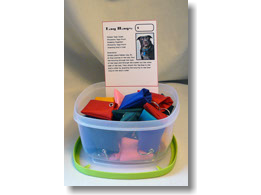 These Muzzles are great for the Dog Groomer or Veterinarian who sees a variety of different sized dogs. 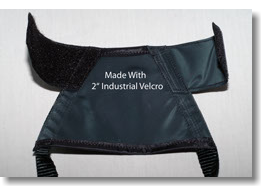 Loft's Muzzles are adjustable in diameter due to the ingenious top flaps that have 2" wide heavy duty hook & loop sewn in place that allows the handler to ajust the muzzle to the perfect size to fit the dog. To choose the proper size muzzle you determine the length of the animals snout then adjust to fit. Made from heavy duty 440D Nylon. Available in Black only. 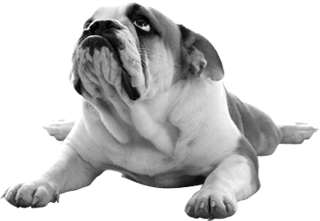 The "No Muzzle" Muzzle is the ideal way to handle the short-snouted breeds from Tea Cup Poodles and Shih-Tzu's all the way up to full size Chows. 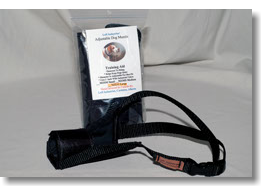 This product's unique design has a "muzzle-cup" made from 440D Nylon with 1/2" wide webbing strap that goes over the top of the muzzle and pulls through the "muzzle-cup" and is held in place with a locking Cam Buckle. An adjustable head stap holds the "No Muzzle" Muzzle in place. Available in Black only. As a retailer you may not sell hundreds of these, but when a customer comes looking and you have one, you'll be their hero. Lof'ts Cat Muzzle is the hooded style. By covering the eyes, this has a calming/semi-paralyzing effect. There is an opening at the end of the nose to alleviate a claustrophobic feeling. Loft's cat muzzle is made from 400 denier nylon fabric which is heavier than others on the market. These items are great for dealing with that pesky four-legged grooming customer who refuses to stand for you during the grooming session. The Heinee Lifter is available in two sizes and each size is fully adjustable and simple to use. Just attach one of the bolt-snaps to your grooming arm and slide the strap under the animal's belly, adjust to desired length, and secure in place by attaching the other bolt-snap to the grooming arm. The Heinee Lifter works best with grooming arms that have more than one eye-hook, but it will work on any grooming arm. These make a great training aid for first-time customers and puppies. Available in two sizes, these products are perfect to assist you when your four-legged friend needs some help. Wether recovering from surgery, hip dysplasia, or suffering from arthritis, this handy item will help you help your friend to get around. 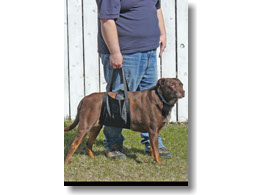 Whether taking your four-legged friend for a walk or helping them into a vehicle, Loft's Dog Sling is just the thing. Made from washable 420D Nylon. Available in Black only. 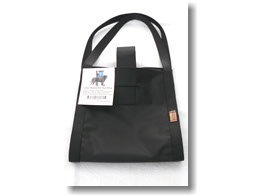 This strong and durable lamb sling is made from 420 denier nylon fabric that is coated with PVC which makes clean-up as simple as wiping it down with a cloth or rinse it down with warm water. The webbing from the handle supports the fabric and gives this sling its strength. Handy adjustable front strap secures with a side-release buckle and keeps the lamb secure until you are back in the barn. These small yet durable bags are made from 420D Nylon fabric and they serve a number of functions. 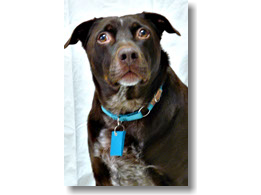 These Tag Bags keep the pets' tags quiet, they prevent the tags from "bleeding" onto the coat of light-colored dogs, and the Tag Bags prolong the life and legibility of the tags by preventing the tags from rubbing against each other. Simply place all the tags inside the Tag Bag, then run the key ring through all the tags and out the other side of the bag. Finally attach the Tag Bag to the Dee ring of the collar using the same key ring. A FREE counter-top display basket with a point-of-purchase sign is available with a minimum order of 30 bags. Available in nine colors: Black, Red, Royal Blue, Green, Purple, Teal, Burgundy, Ping and Gold. These handy items are perfect for the active and concerned pet owner. Made from durable, lightweight and waterproof nylon fabric, these are great for the pet owner who takes their pal hiking, camping, or for extended walks. 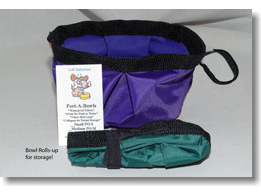 The Port-A-Bowl is soft enough to be rolled-up and placed in a pocket or knapsack, and when your pal needs a drink, just unroll it and fill with water. The stable design of the Port-A-Bowl makes it great for when traveling in the car, or to take when out visiting a friend with your pet. A handy Velcro loop will also allow you to hang the Port-A-Bowl from your belt when empty, to help it dry. Available in two sizes and five colors: Black, Red, Royal Blue, Green and Purple. These toys are Tough! They are made from 4 pieces of 7-strand polypropylene braided cord. Knots at both ends make for great hand grips for tugging with your favorite canine friend. These toys are made for tugging or fetching only. They are not a chew toy. Dogs should not use these toys while unattended. These toys are not meant to be ingested. Available in 22" and 36" lengths and 16 color combinations. Shipped as assorted colors. Sorry, no specific color choices available. Made from our exclusive 7 strand flat braided polypropylene cord, these halters are incredibly strong and extremely comfortable to use. The softer cording is easier on your hands and the animals' nose yet tough enough to get your point across while moving or securing your livestock. Great in the pasture, show ring or lambing barn! This halter is also suitable for goats. Available in two sizes and various colors. These halters are extremely adjustable. Made from 3/4" wide webbing they are doubled and even tripled in all the key areas. Three buckles make the perfect fit possible. All holes are reinforced with nickel plated grommets for extra security and durability. 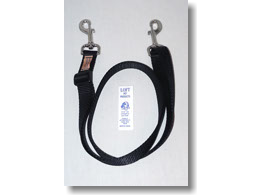 This halter comes complete with a 4 foot lead shank with swivel bolt-snap on the end. Available in 2 sizes and various colors.